No Fourth of July celebration would be complete without some fireworks. For my fireworks in a bottle I selected an Adami Prosecco. It was wonderful. Adami is a benchmark Prosecco producer, located in the hilly area of Valdobbiadene in Italy’s Veneto region. As most of you probably know, Prosecco is the famous Italian sparkling wine made in a variety of styles. Prosecco is a great summer alternative to Champagne. It’s light, refreshing, lower in alcohol and much less expensive than its French cousin. Most Proseccos are made using the Charmat method, a second fermentation in pressurized stainless steel tanks. With Adami the fermentation takes about 30-45 days before being filtered. Avoiding long yeast contact in this phase allows the wine to preserve its typical fruity/flowery aromas. The unusual thing about Adami is that instead of producing all their wine for the year at one time, they perform more than 100 secondary fermentations each year. That means when you buy the wine it will be as light, vibrant and fresh as possible. The Adami Garbél (translated as dry, crisp, pleasantly tart in the local dialect) is a beautiful straw yellow in the glass with inviting aromas of fresh fruit, especially pear and apple. On the palate it is tart and dry, full of balance. There are notes of melon, pear and apple, with a long finish. I loved the Garbél by itself, and it made a sublime mimosa. 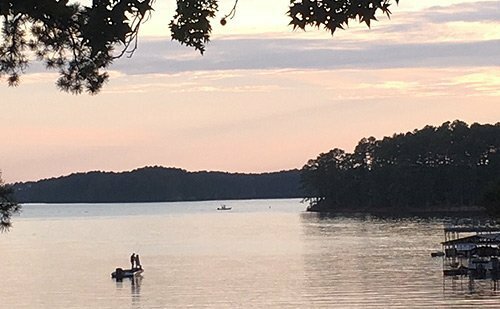 I invited my friends Jeff and Ginger to join me for brunch at our lake house because Jeff was preaching that morning at St. John’s spectacular Chapel Under the Pines on Clarks Hill Lake. He did a fabulous job, as always, comparing lake fishing to fishing for people. I didn’t have any Champagne flutes at the lake, so we used white wine glasses, and I’m glad I did. That allowed us to appreciate the aromas more fully. 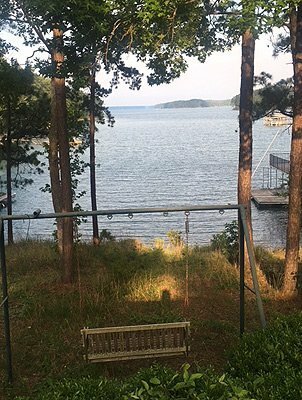 It was a lovely way to relax and enjoy a beautiful summer morning and afternoon at the lake. Oh, and did I mention that Jeff and Ginger’s only daughter is getting married this month? They really needed some relaxation time. Winery: The Adami winery was established in 1920 when Abele Adami bought his first vineyard, Vigneto Giardino. The vineyard features a natural amphitheater carved out of the steep foothills of the Dolomites. The mild days and cool nights are perfect for growing Glera grapes. Following grandfather Abele and father Adriano, the youngest generation, Armando and Franco have brought to the house of Adami a refined technological approach to the art of producing some of the best sparkling wines of the Valdobbiadene. The direct involvement in the success of their Prosecco production is demonstrated in Franco’s current leadership of the Valdobbiadene Consorzio. This is how the family expresses the values of their land: sound work, respect for human relationships, a sense of hospitality and continuity between past and present. An estate, and above all, a family. In 1920 Grandfather Abele purchased the Giardino vineyard (whose name “Zardini” dates to 1717) from Count Balbi-Valier. A southern facing amphitheater with shallow calcareous soil, the Prosecco vines cling to chestnut stakes, and it is here that the Adami’s nurture the production of its greatest sparkler that is recognized as Prosecco’s first “Cru”. 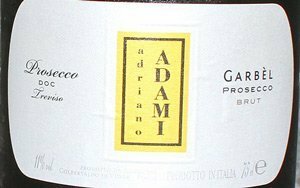 Adami still produces a single vineyard Prosecco from the Giardino vineyard ($22), and several other Proseccos. The family practices eco-friendly sustainable agriculture, minimizing the use of pesticides and fertilizers. Adami wines have a friendly price in part because they are distributed by Dalla Terra Winery Direct, which bypasses the traditional three-tiered distribution system. Distributors purchase and ship direct from the wineries, eliminating an average of 25 percent markup on each bottle. Part of the brunch served with the Adami Garbél. Goes with: I served this with brunch following the lake church service. The brunch featured a wide variety of dishes, so I needed something versatile, a wine that would pair with many dishes. The Adami Garbel filled the bill to perfection. 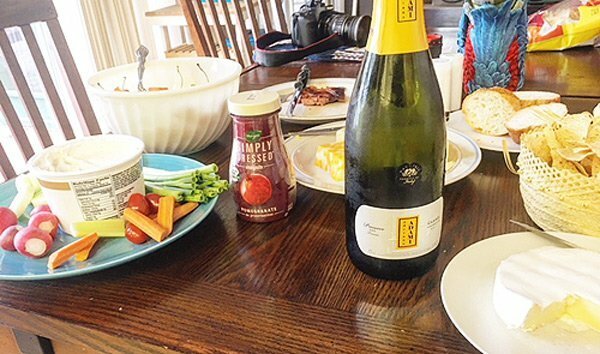 We had a ham steak marinated in sherry, soy sauce and brown sugar, which is difficult to match with wine, but this Prosecco was great, cutting through the sweetness of the ham. We also had several types of cheese, baked beans, assorted fruit, chunks of watermelon, sourdough bread, a veggie tray with French onion dip, potato salad, coleslaw and some sweets. The Prosecco was a nice accompaniment to it all. We loved the Prosecco mixed with orange juice in mimosas. It is the perfect drink for sitting around the lake on a Sunday morning. This is a great wine for celebratory toasts, or with appetizer or snacks. It would be difficult to find a food this doesn’t pair well with. Two lonely fishermen near sunset.